Listen to this track by Anglo-Irish folk-punk posse, featuring guest vocalist, and songwriter in her own right Kirsty MacColl. It’s the 1987 Christmas classic single, “Fairytale of New York”, a story of dreams, drama, dissolution, and drunk tanks all taking place during, or in the context of, the Christmas season. The song appears on the band’s high watermark album If I Should Fall From Grace With God, produced by Steve Lillywhite (Psychedelic Furs, U2, Simple Minds) released in January 1988. Lillywhite was married to Kirsty MacColl, and when the song needed a guide vocal, Steve asked Kirsty to provide one. Originally, the song had been written with former bassist and vocalist Cait O’Riordon in mind. But, O’Riordan had left the band by the time singer Shane MacGowan and banjoist Jem Finer had finished it. When the band heard Kirsty’s vocal, they knew they were onto something. The song would be an enduring one, forever associated with Christmas, and narrowly missing the coveted Christmas #1 that year (25 years ago!). But, what is it about this song that resonates so well with audiences? One element that is obvious is the contrasting voices of MacGowan and MacColl, with a clear-as-a-bell alto from the latter, and a slurred and slightly rumpled growl from the former. Yet, the vocal skills of the two singers do not represent a clear-cut line where the emotional content of the song is concerned. MacGowan’s portrayal of a regretful and flawed alcoholic shows signs of tenderness underneath his rage and regret. And MacColl’s hopeful and long-suffering wife is not a person to be trifled with, with an acid tongue to match her capacity to dream. All of the nuances of the characters come pouring out of the performances, with the timbres of each bringing balance to the whole. And that’s another thing – the characters. This really does feel like a novel packed into a pop song, the story of immigrants to America, looking to start new lives, and yet being dogged by the burdens of their old lives. Throwing the Christmas sentiments of togetherness and connection into it is almost too much not to provide a sure-fire hit, with another aspect of contrast again, the bells ringing out on Christmas Day, while memories of a love lost ring out just as truly. 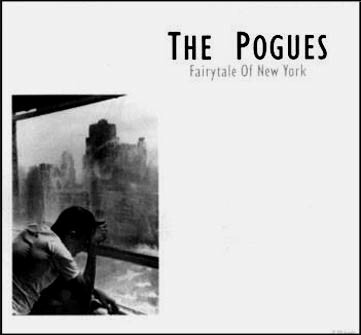 Christmas tune or not, it would become known as the Pogues’ most recognized song, having an extended life in the form of cover versions and re-releases in time for Christmas seasons over the years. I think another aspect that makes this song so welcome during the Christmas season is that it provides an antidote to the often cloying nature of traditional holiday music. It’s earthy, irreverent, and even profane. This is all about contrast yet again, of course. But, it’s also about hearing realistic voices, defined by their quirks, and by their flaws in character. There’s only so much peace and goodwill one person can take before something more realistic becomes more compelling. The Pogues split up for a while. But, more recently, they’ve re-united and invited Shane MacGowan back from exile after many years. You can find out about their recent efforts at ThePogues.com, including their upcoming 30th anniversary show at London’s 02 next week on December 20th. Kirsty MacColl was an established songwriter on her own, exploring a number of musical genres. She was killed in a boating accident in December of 2000. But, you can find out more about her by reading this article about Kirsty MacColl from The Guardian. To celebrate the song’s 25th anniversary, it’s been re-released in multiple forms, including a 7″ vinyl single just like the old days! Check out the “Fairytale of New York” re-release bundle of your choice. I´m gonna write about this song this week too for my song of the week blog. It´s one of the few Christmas songs I can stomach, a classic tune with an inspired lyric.